A report in Air Quality News 'Defra to face double challenge over air quality' (article, 20 July 2012) based on the presentation by Alan Andrews, Client Earth at 'Cities for Clean Air : London 2012'. Another report in Air Quality News 'Lungs of London schoolchildren “damaged by poor air quality” ' (article, 20 July 2012) based on the presentation by Dr Ian Mudway, Kings College London at 'Cities for Clean Air : London 2012'. Air Quality Bulletin, article 'New campaign group - A new campaign group has been set up to influence air quality policy' (Air Quality Bulletin, July 2012 issue 75). Reporting on Twitter (from @ClimateRush on 14 July 2012 #cleanair). Publicity materials distributed priot to the conference included the poster above (and another, PDF), the pre-conference webpage, the press release (below), and a letter published in the Guardian newspaper (letter, 17 June 2012). 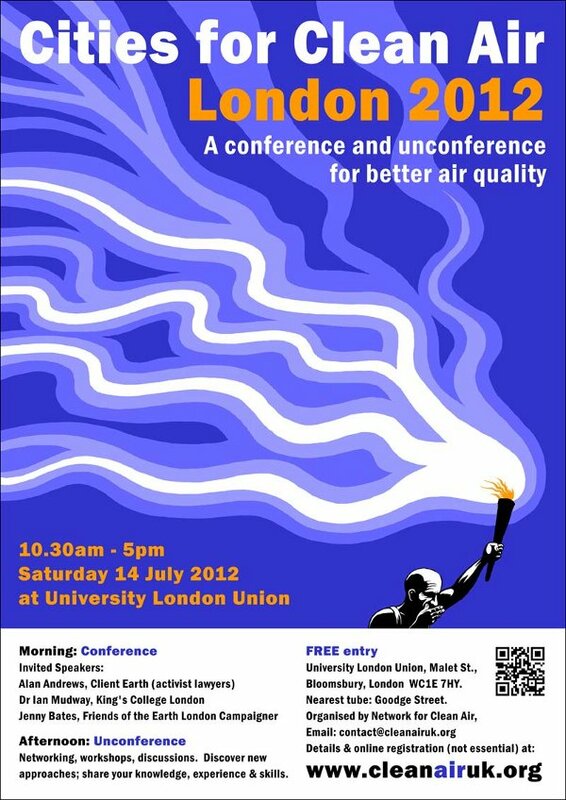 LONDON, 14 JULY 2012: On Saturday 14 July from 10.30 am – 5 pm at University London Union (Malet Street, Bloomsbury, London WC1E 7HY), a conference (and 'unconference') with invited speakers and networking, aims to inspire public involvement in the movement for less air pollution and better air quality. The day long event is about two weeks prior to the opening of the London 2012 Olympics. The conference consists of invited speakers in the morning, and an 'unconference' (networking, workshops, discussions) in the afternoon. The invited speakers are: Alan Andrews, Client Earth (Activist Lawyers) presenting 'Legal Action for Clean Air in the UK'; Dr Ian Mudway, MRC-HPA Centre for Environment and Health, King's College London presenting 'Why Air Pollution is Bad for Human Health'; and Jenny Bates, Friends of the Earth London Campaigner presenting 'London Air: the Politics, the Vision'. There are seventeen places in the UK which will not achieve limits for harmful air pollution (NO2) within legal EU limits by 1 January 2015. Indeed, one of them, Greater London - won't achieve these limits until about 2025. Local authorities and national government need the engagement of civil society to bring forth adequate measures to control pollutants, improve public health and the quality of life. In London alone, poor air quality leads to the premature death of about four thousand people annually (that’s about the same as the ‘great smog’ of December 1952). The seventeen places which will fail to meet statutory air quality requirements are: London, Manchester, Liverpool, Teesside, Hull, Southampton, Glasgow, Belfast, South Wales, West Yorkshire, Eastern England, South East, England, East Midlands, The Potteries, Yorkshire and Humberside, West Midlands, North East England.